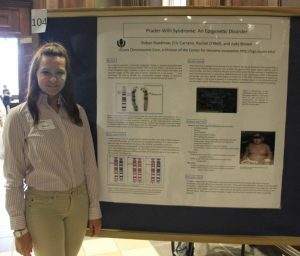 2015-16 Work-Study Research Assistant Program participant Robyn Raadmae ’19 (CLAS) presents a poster about the epigenetic disorder she studied under the supervision of Associate Professor Judy Brown. The Office of Undergraduate Research piloted the Work-Study Research Assistant Program in 2015-16 with 14 student and 8 faculty participants. Over the last two years, our numbers have grown to more than 65 students and 50 faculty participants. We hope to expand the program in an effort to connect more students with undergraduate research opportunities supervised by faculty from all of UConn’s schools and colleges. Through participation in this program, you could hire one or more undergraduate research assistants for the year at no cost to you or your department. The typical work-study research assistant would work 100 hours in the fall semester, and 100 hours in the spring semester. These numbers are based on the typical work-study award amount and the pay rate for the research positions we envision. We can provide exact numbers once you have selected a student to hire. The distribution of the hours of work is flexible within each semester, with the ability to roll hours forward from fall to spring, but not beyond the final day for 2018-19 work-study (May 9, 2019). However, it is expected that the workload will take the student’s academic schedule into consideration and be predictable from week to week. An even distribution of hours would be approximately 8 hours per week during regular classes. If you are interested in participating in the program, it is important to ensure that you will have 8 hours/week of appropriate tasks for your research assistant. Work-study and the university will pay 100% of the student’s wages up to the dollar limit of their awards (e.g., $2,200 for the academic year). If you wish to continue to pay the student for additional work (and their schedule permits), you would be responsible for 100% of the wages, and would need to make the relevant payroll arrangements with us. You have control over the hiring process. You edit the job advertisement, you review the candidates, you interview the candidates, and you choose to hire the research assistant. The only constraint is that the student must have a 2018-19 work-study award. Once you submit a detailed advertisement for your job (see below), OUR will post the job, collect the applications, and forward all of the eligible applicants to you for review. The goal of this program is to help high-need students develop research skills and interests. Research experiences develop transferable skills and can change the course of a student’s academic and/or professional career. Our expectation is that the research assistant will be substantively engaged in your research – these are not to be exclusively clerical or lab upkeep positions. Review the Guidelines for Faculty Posting a Research Assistant Position. Edit one of the following job descriptions (the one most appropriate to your field – 201, 202, 203, 204, or 205) to include the specific duties you expect the assistant to execute, the qualifications s/he must have, and the application materials you wish to receive. Email this to Jodi Eskin by Monday, July 2nd. Please be in touch with Jodi if you have any questions or need more time for this step; we will gladly work with faculty to post jobs submitted after the preferred 7/2 deadline. Note that students awarded Federal Work-Study are actively seeking jobs over the summer we prefer to post the positions as early as possible. Jodi will work with Student Employment to post the opportunity for a minimum of two weeks. Review the applications sent to you by OUR, conduct interviews of finalists (phone or Skype is fine), and inform OUR of your choice of research assistant. Complete the necessary Employee Safety Training Assessment (ESTA) with the research assistant to determine the required safety training, and assist the student in enrolling in training courses. Discuss your expectations with the research assistant and supervise his/her work. Regularly review a time-tracking spreadsheet to ensure your assistant’s work hours are reported accurately. Note that all payroll and timekeeping processes will be managed by OUR staff – these will not be the responsibility of your departmental staff. Submit a brief report on your assistant’s work by December 14, 2018 and May 15, 2019. Feedback from faculty on how the program is working is essential to the development and modification of this program for future years. Please contact the Office of Undergraduate Research at our@uconn.edu or 486-7939 with any questions about this program.